As Egypt’s military-dominated government continues its sometimes violent crackdown on the Muslim Brotherhood and supporters of ousted president Mohamed Morsi, the Obama administration is reportedly planning to curb a substantial portion of the $1.3 billion it provides that country in military aid. Such a move, representing a major shift change in relations with a country that had been a key ally in the Mideast, generally has support among the U.S. public, if recent polls are an indicator. A Pew Research Survey conducted in August found that 51% of Americans believed the U.S. should cut off military aid to Egypt to pressure the government there to end the violence against anti-government protesters while 26% said it would be better to continue military aid as a means of maintaining U.S. influence. Half of those surveyed said President Obama had not been tough enough with the Egyptian military in response to the violence against protesters, while 12% said his response had been about right. A large number — 32% — expressed no opinion. Although the U.S. public on balance preferred a tougher line in dealing with the Egyptian military, 45% of those surveyed said the military would provide better leadership for Egypt compared to 11% who said the Muslim Brotherhood would do so. About one-fifth (19%) said neither would provide better leadership for the country and a quarter expressed no opinion. Public interest in events in Egypt has not been high — in August, 22% said they were following news of political violence very closely — but it has been far lower than when the Arab Spring swept the region two years ago. Events in Egypt also come at a time when Americans want to see the U.S. less involved in Middle East political changes. More than six-in-ten (63%) held that view in a survey in October 2012 while just 23% wanted to see greater U.S. involvement. 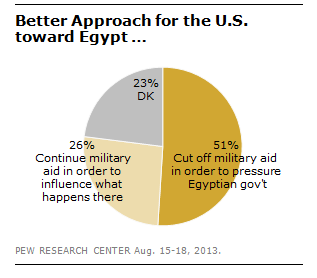 Whatever value Egypt’s government puts on the U.S. military aid, the Egyptian public has a dim view of it. In a survey conducted last spring before the current turmoil, 58% of Egyptians said U.S. military aid had a mostly negative impact on the country.